Here we find an agressive male plated behemoth, it’s teeth specifically designed for ripping out the jugular of its prey with powerful jaws. 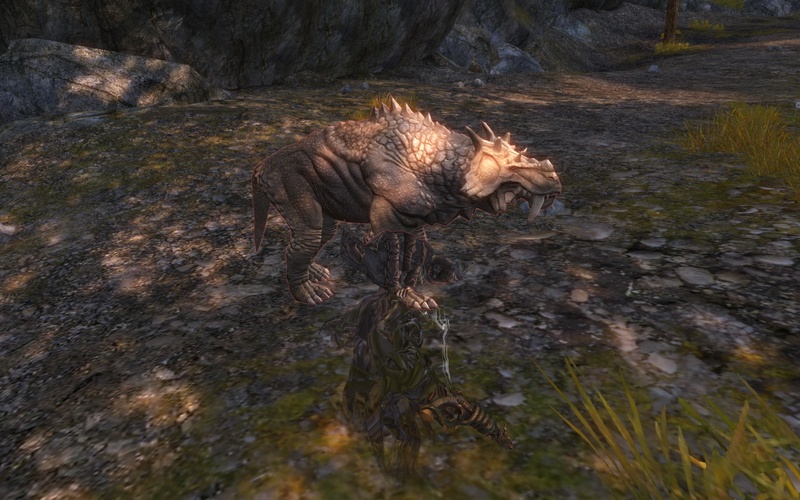 A while back I had the idea to write about the unsung monsters of Tyria. The beasts that are shunted to the side, ignored, and unremarked upon. It gets a little tiresome killing the same monsters over and over again. So I thought why not point out some of the creatures that we rarely see and hope to see in the future? Dry Top reminded me of my original idea. The colocal was one of the creatures I had thought to fight more of. Although it is obviously griffon, they had previously been only seen in just a few areas of Harathi Hinterlands. Even so, their appearance is unique, and I was happy to see them in Dry Top. Even if they don’t appear to have any particular skills, aside from the Colocal Queen. And now there are rumours of a giant. Curses! I should have thought of that one. They can be found in Diessa Plateau, Hirathi Highlands, and Brisban, while peaceful giants can be found elsewhere. There are very few hostile giants in the traveled lands of Tyria and to date I’ve killed but 13 of them. But there are other beasts. There is the Cavern Scutter. A very alien crab/face-hugger looking creature. It’s typically very small but there isn’t a single veteran or champion of its kind. They’re only found in very rocky areas in Brisban, Mount Maelstrom, Genderren Fields and Bloodtide Coast, and typically in very small numbers. I’m hoping to discover these lurking in a cave or dark canyon in Dry Top. The penipal is also quite rare. A cross between a manatee, a sea lion, and a quaggan, I actually doubt most people would recognize this creature if they came upon it. It has a pretty specific habitat, near frozen water in the shiverpeaks, so unless there is a desert species I would imagine we won’t be seeing the pinipal any time soon. I’ve also seen very little of the Plated Behemoth. I can count on my fingers how many times I’ve actually fought one, they are typically neutral. I rarely attack such timid creatures. They’re a sort of rhinocerous looking thing. Again I’ve not seen them in large numbers or as veterans or champions. This one in particular might fit a desert landscape. If I look through my records I can see that two types of creatures stand out in their obscurity. Hylek and plants, and although I doubt the desert is a good environment for hylek (aside from the brutish female already in zone) and I’ve already predicted plants in Dry Top recently. Twisted nightmares haven’t been seen anywhere since Scarlet met her end, but I can hardly believe we’ve seen the last of such impressively designed monstrosities. As we’re investigating some of Scarlet’s former haunts, maybe we’ll see more of them, or more steam creatures, which she also took an interest in. Of course there are new monsters to fight as well. The dust mites in Dry Top, the tentacles that have appeared, I’ve never seen anything like them. Some monsters are better off rarely appearing of course. When they are elusive, mysterious, it is more interesting. When they do appear it’s special and different. 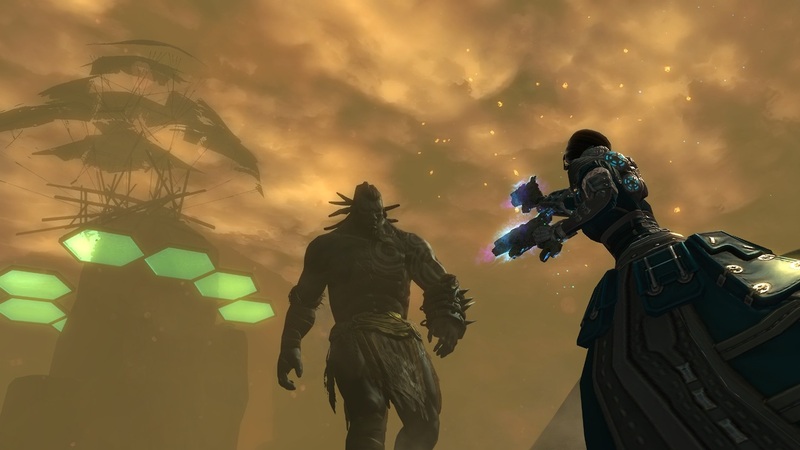 A Karka in another region would certainly take something away from Southsun Cove, though I wouldn’t be disappointed to see more of them.